Cardo maximus ("the main line") was the main North-South royal road in the Roman and Byzantine Aelia Capetalina (Jerusalem). A small section of this grand and wide road was excavated in the Jewish quarter, probably built in the 6th C AD. Zechariah 8 4-5: "...There shall yet old men and old women dwell in the streets of Jerusalem... And the streets of the city shall be full of boys and girls playing in the streets thereof." Cardo Maximus, or simply the Cardo, was the main North-South "Boulevard" of Aelia Capetalina, the Roman and Byzantine city that was established in the 2nd C AD. It was a monumental royal road, which was typical of the grand Roman cities. It is emphasized in the Madaba map, showing that it played a central role in the urban design of the Byzantine city. The excavated street is located in the Jewish quarter, near the main Jews street. It has an open air section, a small museum and some art & jewlery shops. The street was designed by the Romans in the 2nd C AD after the city was established and rebuilt by Hadrian, which razed the city following the failed Bar-Kochva's revolt in 136 AD. This was the main North-South street that crossed the city from the North (Nablus Gate) to the south (Zion gate). Another route split from the north gate from this main street to the Valley Cardo, which ended near the dung gate. Initially, the Cadro Maximus was constructed only in the northern section, probably by Constantine the Great (4th C AD). This section was not excavated. The southern section of the road, in the Jewish quarter, was excavated and most of the archaeological findings were from the 6th C AD. Thus it is likely that this section was commissioned by Byzantine Emperor Justinus (565-527 AD), when the city became an important Christian center and the southern section has increased in population. At this emperor's times the city witnessed an expansion and grand projects were launched, including the southern section of Cardo Maximus. The road linked between the two main Churches at the time: the new Nea church (built by Justinus I) and the Church of the Holy Sepulcher. Its wide and grand design was useful for the religious marches, glorified the city and adapted it to modern traffic. The road stopped to function after the Byzantine period (7th C AD, after the Arab conquest) and was altered over the years. In the area between the buildings on both sides of the Cardo, new shops and workshops were built, some reusing parts of the stones. During the Crusaders period three covered markets were constructed on the basis of the Cardo Maximus, and some of the arches have Crusaders markings ("SA"=Santa Anna Monastry, "T"=Templars). After years, the Cardo pathway became a large bazaar, as it is today. 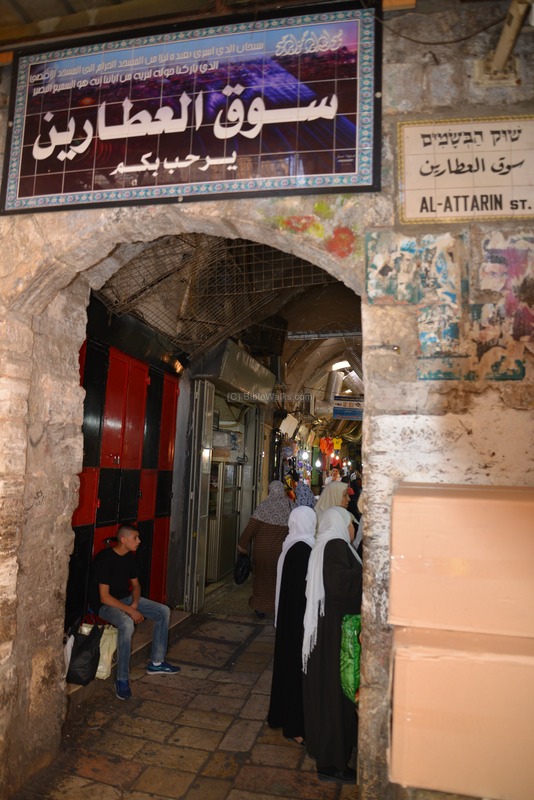 The modern streets (Khan Az Zeit, Suq Al Attarin) still follow the original orientation (a line from Nablus gate to Zion gate) but have narrowed down and snaked through randomly built houses, losing the initial ordered design. Cardo Maximus was excavated in 1975 by N. Avigad after the Jewish quarter development society commissioned a development project for the area. Several of the houses were leveled, others were dug under their foundations. The complex excavations took 2 years to complete, and it is interesting to follow the description of this expedition. 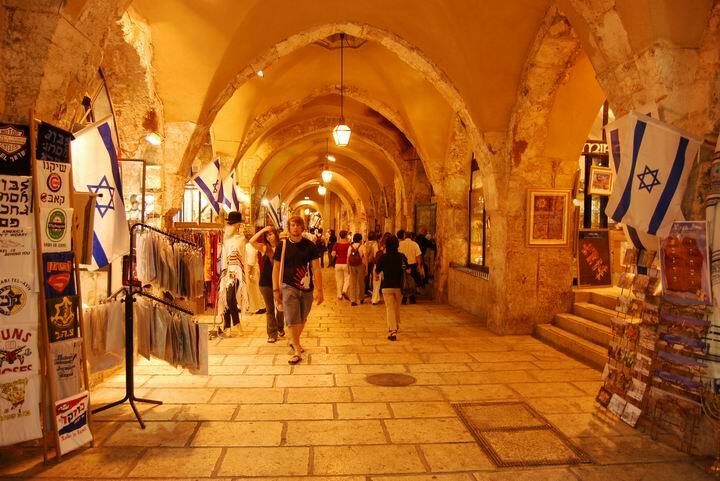 Today, the visitors to the Jewish quarter can see a small section of this magnificent Roman street, and using some imagination - visualize how was the life in the Byzantine city. 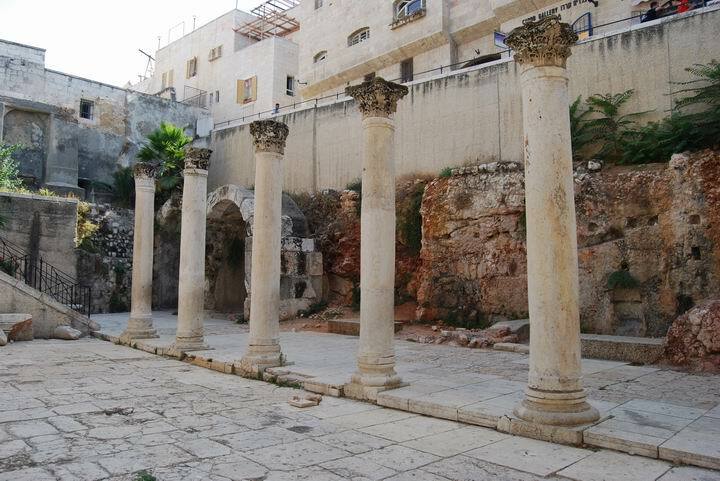 The excavated Cardo Maximus, a 150M stretch, can be seen in an open air section in the heart of the Jewish quarter, between the Jews street and Chabad street. This section is 2.5M under the modern street level. Its width is 22.5m (74 ft), and is flanked by a row of 5M high pillars on both sides of the road. The Byzantine street was open to the sky in the center, but was covered on both sides with terra cotta tiles supported by wood planks, that connected the pillars to the houses on the sides of the road and provided a protection from rain and sun. Near the Stylobates (pillar base level) were drainage tunnels to collect the rain and keep the road dry. The view of this section from the Cardo street level. The modern street and the Jewish quarter houses are seen above the Cardo. 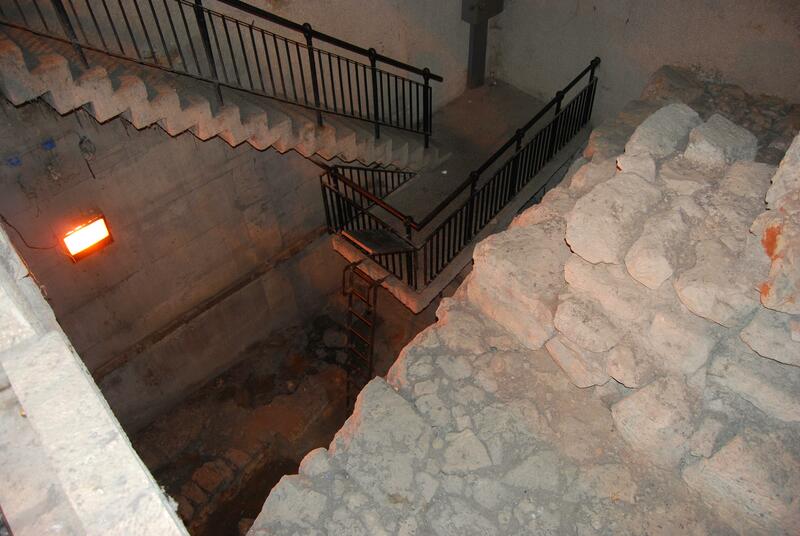 Some sections of the excavated Cardo are located under the modern houses of the Jewish quarter. The following photo shows a reconstructed section, with the wooden roof planks. The pillars and some of the bricks are from the original Byzantine road. It is interesting to correlate the Cardo to an ancient map of the Holy Land from the 6th century AD. 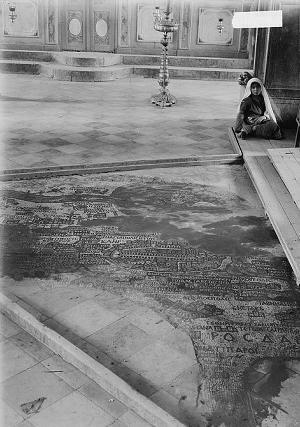 The famous map appears on a mosaic floor, which was discovered in 1884 in a Byzantine church in Madaba, Jordan. The ancient map shows the layout of the Holy Land, with dozens of illustrated sites. An old photo on the right shows a section of the map. 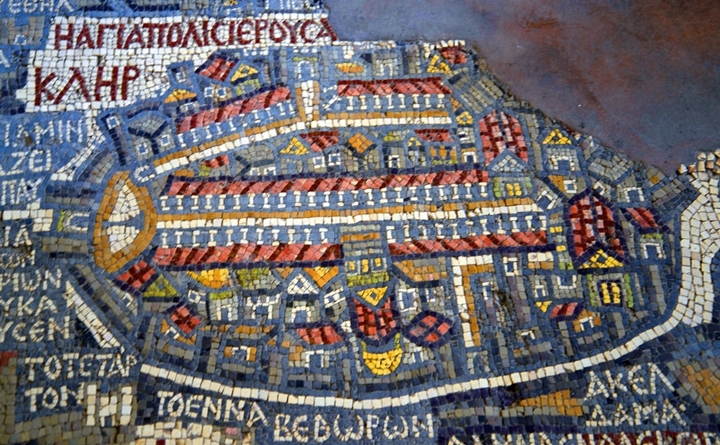 Jerusalem is illustrated in a 54 x 93 cm section of the Madaba Mosaic map, which is shown in detail below. Jerusalem is seen in a perspective aerial view from the west, and reveals several of the highlights of the city, including the Cardo Maximus, which is shown as a straight line crossing the city North to South - from left (Nablus-Shchem Gate) to right (Holy Zion Church in Mount Zion). Section of Madaba map in a historic photo. There are two important churches along the road: The Nea (on the right side of the road) and the Holy Sepulcher (in the middle of the road). Another eastern road connected the north gate to the south, passing between the temple mount and the upper city, and reaching the dung gate. Point on the map on some places to get details on the highlights in the map. Notice the fine details of the tile roof, wood planks and pillars which are exactly as was found in the excavated Cardo. This city design implies a Roman Urban design, with the main road and straight parallel and orthogonal streets. This was typical to all major Roman cities and army camps. As the ancient map above demonstrates, Jerusalem's design started from this clean design, as the Roman city of Aelia Capetalina. However, over the years and after several cycles of destruction and rebuild, the city evolved over the years into a more 'eastern' design - narrow, disarrayed and crooked streets. A model of the Byzantine city that is displayed in Saint-Peter-in-Gallicantu Church shows how central was the Cardo Maximus. It seen here from the side of Nablus (Shechem) gate on the north (here on the bottom), straight across the entire city towards the Nea (on the far left side) and the Holy Sepulcher (on the far right side). Although the Cardo is already 2.5M under the Modern street level, it is a relatively "new" level if you go back in the history of the city. Under the Byzantine road are earlier layers: Hasmonean Kings from the Hellenistic and early Roman periods (1-2 C BC; seen in the photo below just under the Cardo pillars, several Meter deep), and beneath it from the first temple wall (8th C BC; several meters below that layer, not seen in this photo). 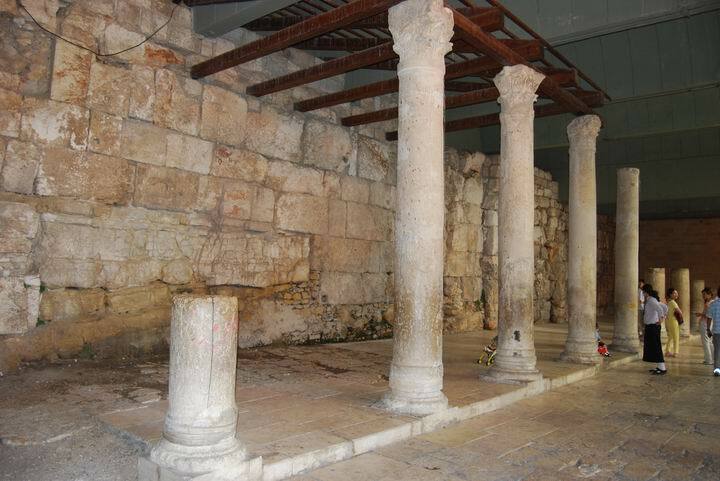 The deep cavity between the pillars is a water cistern from recent times. Another view of this amazing display of the history of the city, as seen in the deep layers under the Cardo. The higher level is the 1-2C BC wall, where the lower level is from the first temple period (8th C BC). Along the path of the Cardo is a small modern shopping center with 2 dozen small shops, which are lined on both sides of the modern covered road that follows the path of the Cardo towards north. The photo below shows a section of the shops. Along the pathway are several wells, where you can see through their glass cover the ancient layers of the city. North to the modern Cardo shopping center in the Jewish quarter, the narrow Arab quarter shops continue the path north towards the Damascus (Nablus/Schem) gate. These shops are much older, operated by Arab owners, and were built over the path of the Cardo Maximus. This section, 125m (136 yards) in length, is located between David street (Suq el Bazar) and El Saraya street. It is parallel and east to the Muristan section of the Christian quarter. 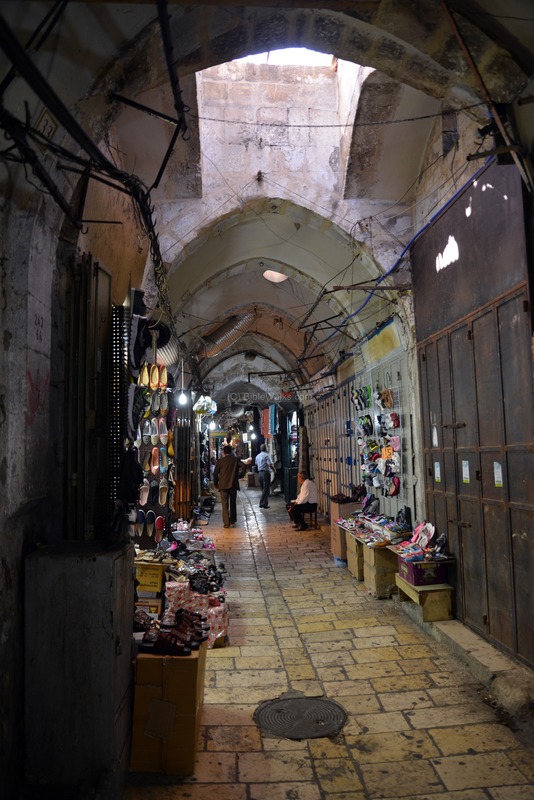 Here, the Crusaders split the wide Cardo street (22.5m, 74 ft) into 3 north-south narrow alleys, which were converted to covered markets. 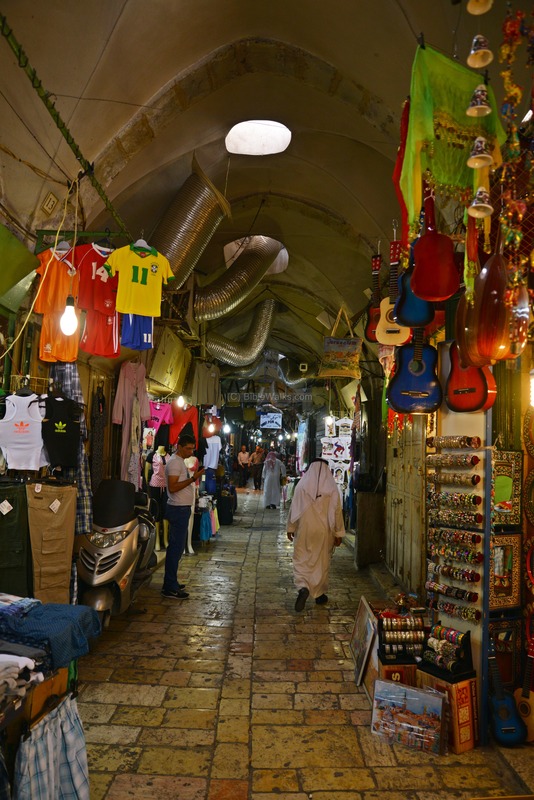 These market (Arabic: Suq) alleys are named: Suq el-Khawajat, Suq el-Attarin (Hebrew: Habsamim, English: perfumes) and Suq el-Lahamin. The Suq Lahamin street, for example, has 83 shops on both sides of the narrow alley. It is known by different names: "Vegetable market", "Spices street", "Herbs street", "Butcher's market". The width of the street varies between 2.34m (7.7ft) and 3.71m (12.2ft) . The vaulted roof is 6.1m (20ft) above the pavement. Along the walls are engraved inscriptions dated to the Crusaders period. 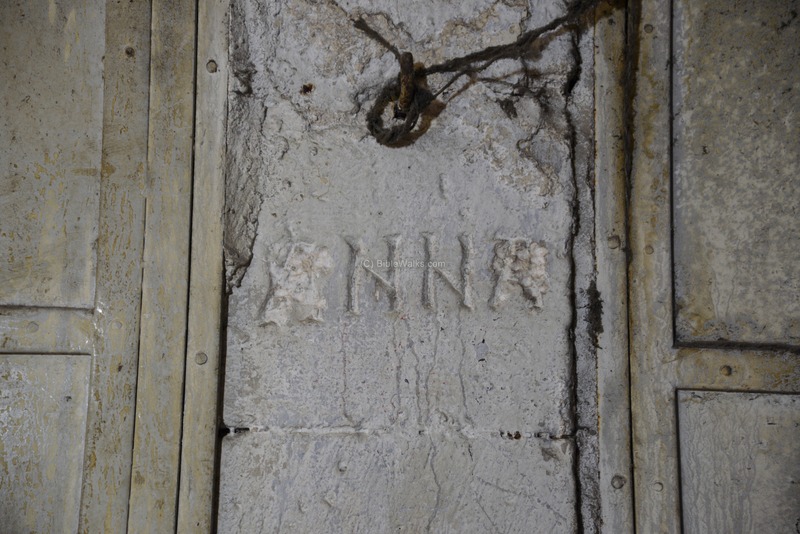 These inscriptions, "ANNA" (as below), "SCA ANNA", "SCA", mark the owner of the Suq Lahamin market, in this case the church of St. Anna. Other streets bare inscriptions such as Templars ("T"). The markets were one of the sources of incomes of the institutes of Medieval Jerusalem. "The Upper city of Jerusalem" , "Discovering Jerusalem"  - by Nahman Avigad, who mastered the excavations in the Jewish quarter (1969-1979). Eastern Cardo - in the Madaba map there is an eastern (upper) section. 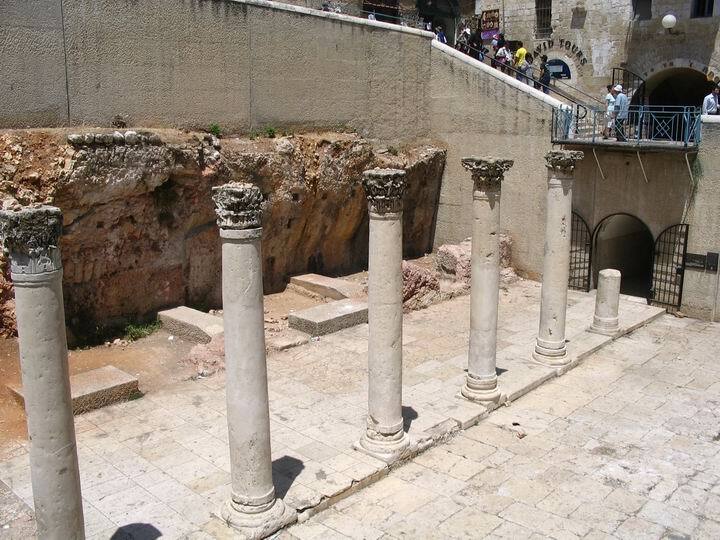 It has been discovered in 4 sections in parallel to the Cardo Maximus, such as a section near station 3 . Nea - Latin: New. This grand church was built in the 6th C AD on the southern side, destroyed, and was excavated. It was discovered based on the location that was suggested by the Madaba map - see the amazing story in Avigad's book.